Four years after Tyler Martel became addicted to oxycodone, he asked to move home. He had gone off to college, and then one by one pieces of his life – his job, driver’s license, car, furniture, friends – started to fall apart. His mother, Patrice, knew it was really bad when he tried to pawn his beloved golf clubs for $50, so she bought them and kept them for him. His first quarter in college resulted in a 3.4 GPA; the following quarter he didn’t attended any classes. Patrice told him he had to get clean if he wanted to come back, and he did. On Wednesday, Patrice Martel stood before a crowd of high school students at the Bob Larson Stadium in Stanwood. Before Martel’s speech, participants reenacted a tragic, heart wrenching DUI-related accident. Firefighters cut open the door of a car, peeled off the top of the car with the jaws of life and depicted the catastrophic consequences of driving while under the influence of alcohol or other substances. 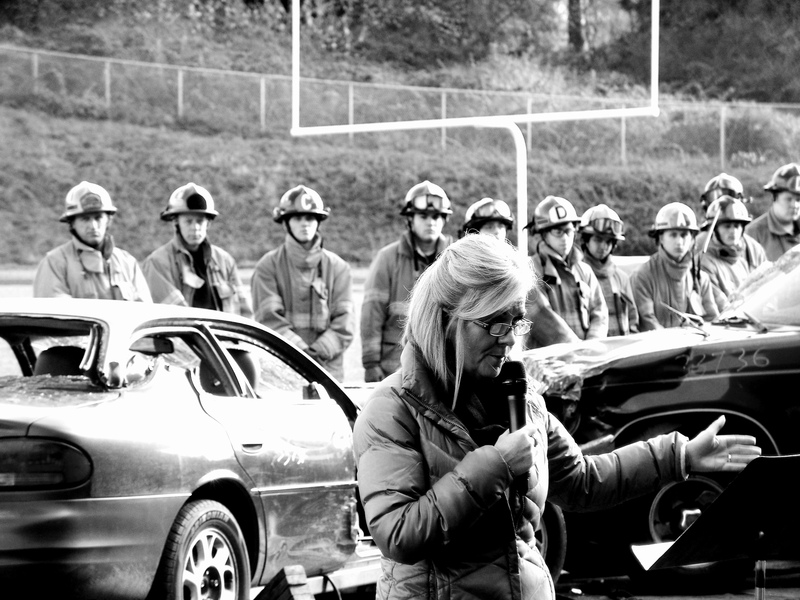 Presented by the SHS Fire Cadet program, participating agencies included North County Regional Fire Authority, Camano Island Fire Rescue; SnoPac, Stanwood Police Department, Washington State Patrol and the Snohomish County Medical Examiner’s Office. “This is about the time of year when it’s really important to impress these lessons on the minds of youths,” said Deputy Greg Rasar of Stanwood Police Department. It’s spring, and a lot of parties and events will be firing up that can, at times, result in underage drinking and getting behind the wheel intoxicated – a brand of youthful indiscretion that can cost lives, said Rasar. Martel’s speech, part of the school’s DUI Consequences Drill on Wednesday, recounted the story of her son, Tyler. The same kid who moved out of the house a few years earlier in a U-Haul moved back with just a few plastic bags full of clothes – filthy, ripped and torn. Over the following weeks, Martel felt the beauty of recovery and redemption. He kept his word; he got clean. And in a beautiful turn of events, Martel beat his addiction: he got his job back, he got his license back after paying Snohomish County $6,000 in fines; he bought a jeep, and he even paid his mother $50 and got his golf clubs back. He was in the best physical and mental condition of his life. It was Dec. 7, 2012. The Martels’ company – they serviced gutters for a living – had their Christmas party at the Mill Creek Country Club. Everyone had cocktails, but Tyler didn’t drink because he wanted to get Stephanie home safely that night. Tyler and Stephanie stopped by his parents’ house on the way home from the Christmas party. That night they talked about getting married. Stephanie and Patrice looked at wedding dresses on the Internet. They talked about children’s names – they wanted to have babies right away. The wedding was set for summer of 2013. Tyler and his brother had plans to snowboard the next day, Patrice and Stephanie had plans to go Christmas shopping and everyone wanted to get an early start, so they hugged at the door, they said “I love you” and they left for home. At 3:45 a.m. Patrice was awakened by the doorbell ringing and two Washington State patrolmen standing on the porch. “They said ‘I regret to inform you’ and that was all I heard,” Patrice said, her voice heavy with the emotion only a grieving mother can feel. Tyler Martel died on impact after crossing the yellow line and crashing into oncoming traffic. Later, Patrice said, she realized she had shown the officers pictures of Tyler when he was just 8-years-old. His precious Stephanie, the woman he wanted to spend the rest of his life with, survived the crash, but was medivaced directly to Harborview Medical Center. The rest is a blur: family came and went, shock turned into grieving, and in eight hours Patrice Martel had gone from planning a wedding to planning a funeral. As the days following Tyler’s tragic death passed one by one, Stephanie – seriously injured – started to improve. She had several surgeries, even a partial removal of her skull to allow her brain to swell. Soon, she was able to wiggle her toes, snap her fingers and even mouth the words “I love you” to her mother. After her final surgery, Stephanie had a stroke. On Jan. 19, 2013, Stephanie Nicole Proffitt died. Martel said the hardest lesson for her was learned a week later at Stephanie’s funeral, when she was introduced to a young man in a wheelchair named Timothy Lang. He was the young man in the other vehicle. Shortly before that, the Martels had received the results of Tyler’s autopsy back, and learned that there wasn’t a drop of alcohol in Tyler’s blood. Yet, he had tested positive for marijuana. It was the first fatal accident after the new law legalizing marijuana passed in Washington. Had he lived, Patrice said candidly, he would have been prosecuted for vehicular assault in the case of Timothy Lang, and vehicular homicide for the death of the woman he loved. It took 18 months for her youngest son to tell her that, on the night he died, they’d snuck outside to smoke a little pot before Tyler left to go home. At Stephanie’s funeral, they had faced Timothy Lang, the young man who had been in the other vehicle. She let her words sink in. In the football stadium full of teenagers, you could almost hear a pin drop. “I pray that my son’s death will serve to benefit your lives,” she said. Next to a poster-sized picture of Tyler and Stephanie, held up by her niece, Sarah Gammell, a teacher at SHS, Martel eyed the attentive, youthful crowd. “Look down at your shoes,” she said, and each gaze dropped to the floor.